The Pyramid Collection features the most spiritual selection of New Age treasures for the New Millennium! From powerful crystals and gemstones to Celtic dresses, Gothic crosses and Gothic gowns, plus other authentic Renaissance fashion styles! Explore an online catalog of spiritual and personal growth to Gothic gowns, Medieval headdresses, Gothic artwork and Gothic crosses. With a fantastical variety of Celtic, Wiccan and Fairy themed products, you'll be sure to find everything a Medieval lover could want! Gothic crosses - Medieval times are back with a vengeance, and there's no better way to follow the trend than with a traditional Gothic cross. From Celtic cross pendants featuring the Celtic Tree of life to Crystal crosses and Multi-stone Gothic crosses, you'll find aromatherapy amulets, pendulums, pentacles and other enchanting crosses and charms. You'll be up to your neck with The Pyramid Collection catalog jewelry box filled with exquisite Gothic inspired crosses, necklaces, pendants and chains. Gothic gowns and clothing - Hear ye, hear ye! A royal wardrobe awaits, full of medieval gowns and Gothic clothing for young lasses across the land! Find a Medieval dress that will bring you back to your ancestral roots with plenty of Renaissance dresses and Gothic gowns to choose from! Don't forget to complete your look with traditional Gothic lingerie and corsets to wear under your authentic Gothic skirt! Gothic jewelry - Accessorize your Gothic dresses and gowns with spiritual Gothic crosses and other mystical jewelry designs. Decorate your hands, ears and neck with crystals, Gothic skulls, Gothic jewelry rings, crosses, cuffs, pendants and a catalog filled with enlightening jewelry pieces, gemstones and authentic bling! Even more Gothic stuff! - Besides your Gothic gowns, crosses and Renaissance clothes, you'll discover an even wider variety of Gothic items and gifts to choose from! Find Gothic and Renaissance statuary, decorative accessories, spiritual ornaments, chimes, incense, aromatherapy, zodiac calendars, votive lamps, art prints and the list goes on and on! Find hundreds of unique and fanciful cultural items from around the world. 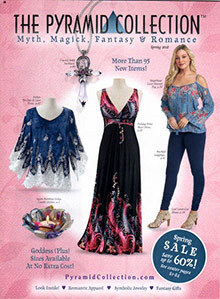 Featuring the widest selection of Gothic rings, crosses and medieval fashion, you'll find pages and pages of New Age clothing, books and truly entrancing gift ideas, all from The Pyramid Collection catalog.